This is an amazing and true story of the Tyneside Irish and the battle of the Somme, a piper missing, warpipes lost then found and the Warpiper that plays them today. The Tyneside Irish Regiment was raised in the early months of WWI from the large numbers of Roman Catholic men in Englands County Durham coalfield. Many of their Fathers and Grandfathers had come to this county in England after the 1847 Irish potatoe famine in search of work in the pits and in 1914 they organized themselves to fight against the German threat. The Tyneside Irish were the first Irish regiment to have not just a pipe band as an official part of the regiment,but a Warpipe band. 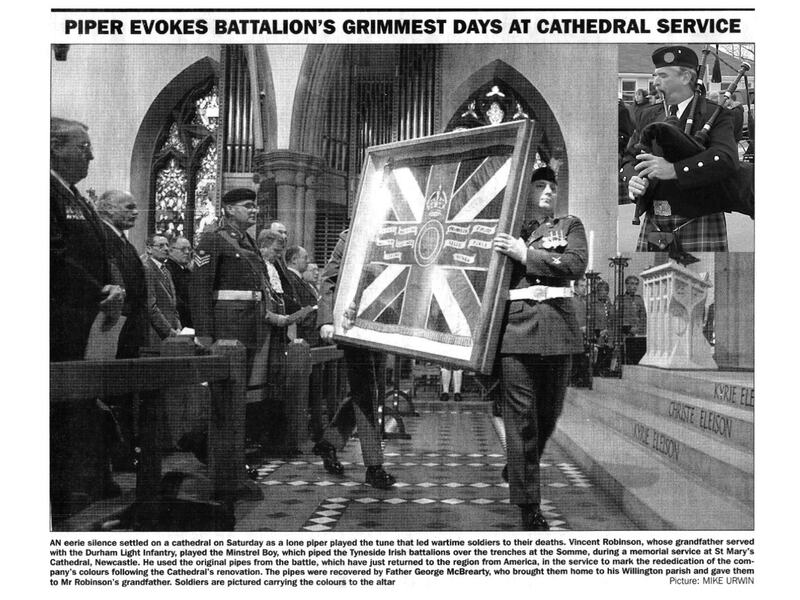 As they went into battle on July 1, 1916 the regiments pipes and drums were in the middle beating time as the men marched into German gunfire. One piper felt compelled to jump out of the trenches and strike up the pipes as the men advanced. He continued to play until he himself fell among the wounded and the dead. 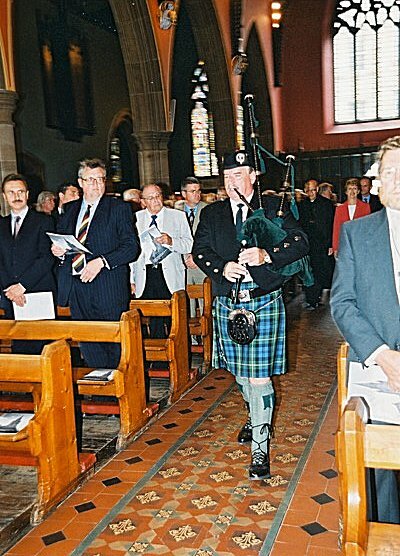 The fate of the piper is not known but his pipes were collected by the regiments Chaplain Fr George McBrearty, who had been wounded himself. In 1923 Fr McBrearty presented the pipes to William Robinson, a parish member who had served in the Durham Light Infantry. The priest asked that the pipes remain in the Robinson family. In 1929 William and his family moved to America in search of a better life. The pipes did indeed stay in the family. Today the pipes are played by William's grandson Vinnie Robinson who is Pipe Major of the Siol na h'Eireann Pipe Band. Knowledge of the pipes existance had reached England's county Durham via the internet. 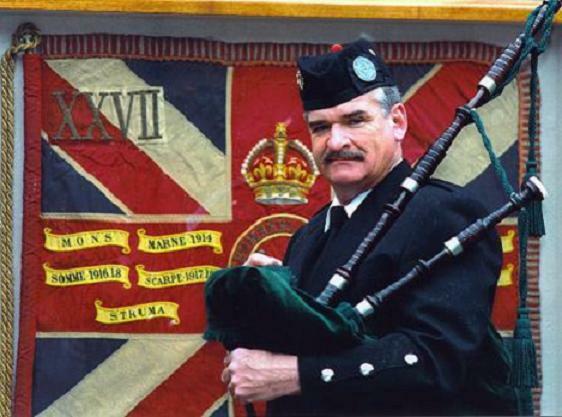 Because the Tyneside Irish regiment had ceased to exist with its men dead after that battle, the regiments colors were never officially retired.Vinnie was invited to come to England to play the Warpipe of the Tyneside Irish at the cermony to indeed retire those Colors. 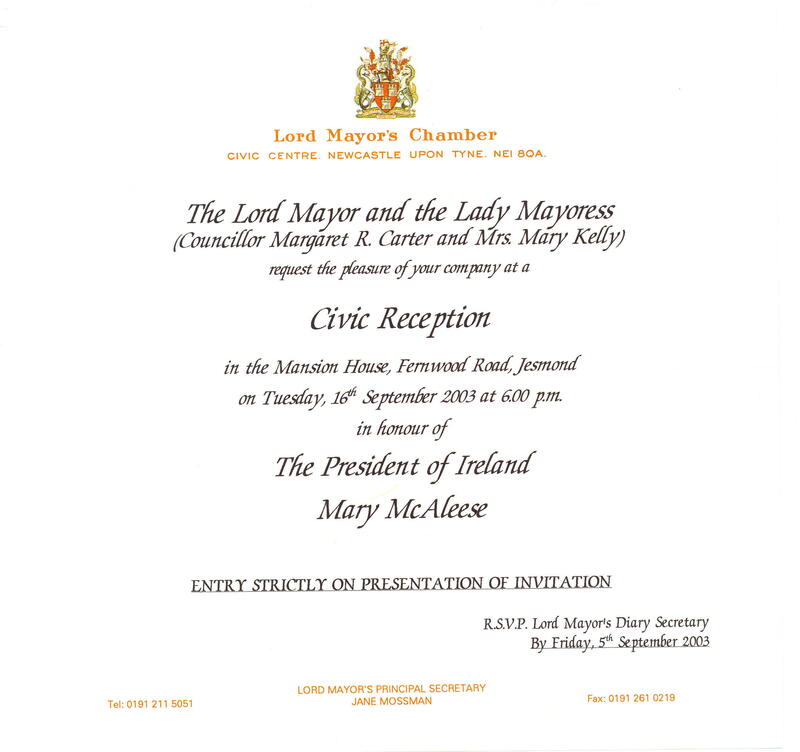 Also attending that event was Ireland's President Mary McAleese. She insisted that she have her picture taken with Vinnie and the pipes. Like myself, Vinnie is also a member of the Ancient Order of Hibernains. God Bless Vinnie for helping to keep this great Irish tradition alive. Below are some photos of Vinnie and his Warpipes. Above is the invitation to the event. Vinnie playing at the church ceremony. Note that the Irish President is walking behind him. 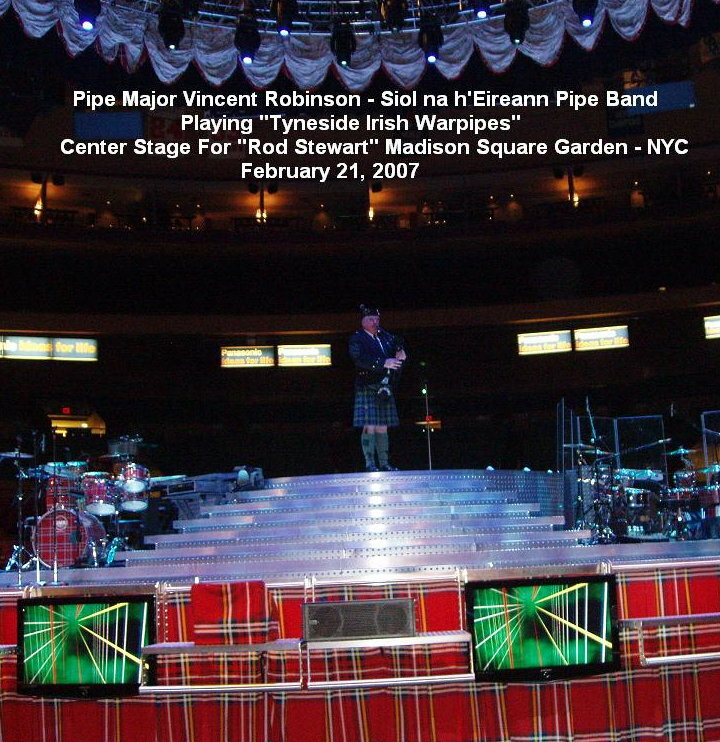 An inset photo of Vinnie playing at the ceremony. Vinnie and pipes in front of the retired Colors. Above, a very different performance by Vinnie. 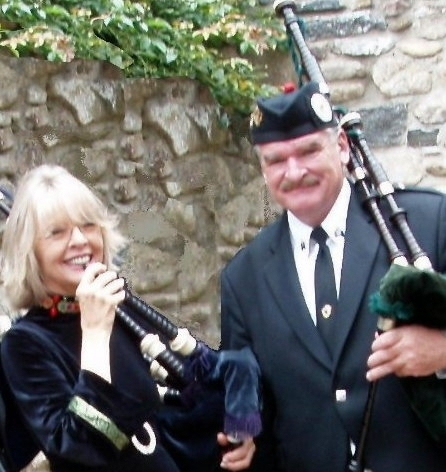 Below are two photos of Vinnie and his pipes on a movie set with Diane Keaton.